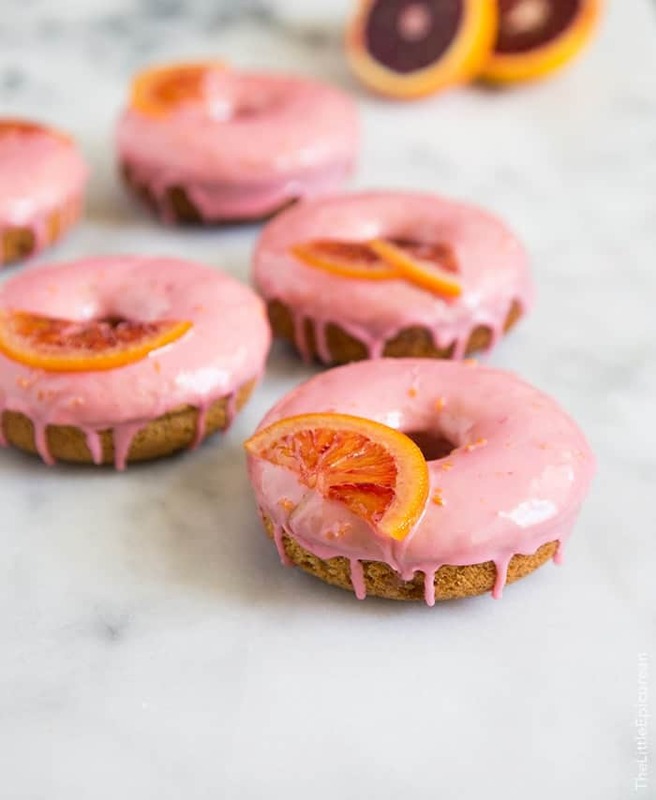 These baked blood orange donuts are all natural in color and such a delicious treat! I’ve always associated citrus with summertime. Ice cold lemonades, limeades, and such bring memories of hot summers. Imagine my surprise when I finally learned that winter is the peak season for citrus fruits! Winter needs as much pops of color as possible. That’s why I love blood oranges so much. I’m always so excited when I start seeing them for sale. I love the anticipation of slicing into them and seeing the beautiful colors inside. Sometimes they’re super bright orange, other times a rich dark red. But the best ones have that fancy ombre thing going on with reds, pinks, and oranges. Last year I made these super fun pink Valentine’s Day cake donuts (i.e. my most stolen photographs). I used pink food gel coloring and a ton of sprinkles for that recipe. This year, I wanted to go the natural route. 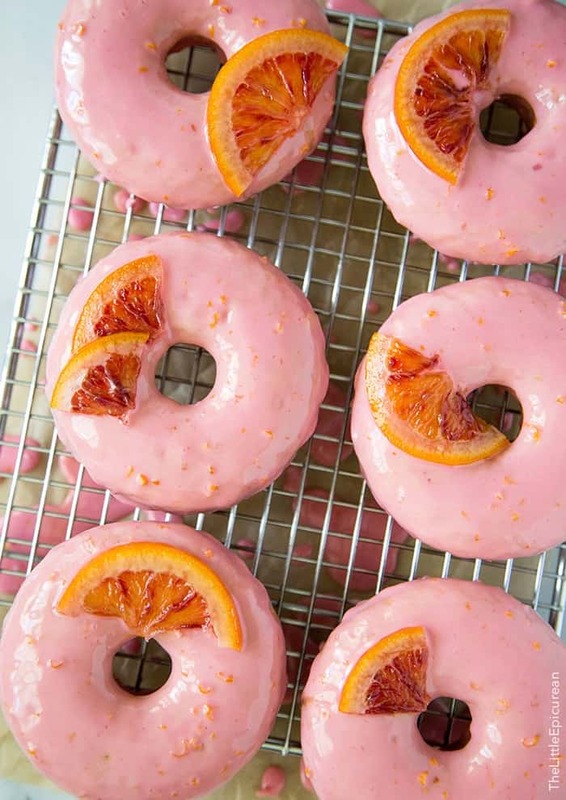 These blood orange donuts are all natural! That nice pink hue? Yup, that’s real. No dyes, no chemicals. And that pretty garnish? Candied blood orange slices! 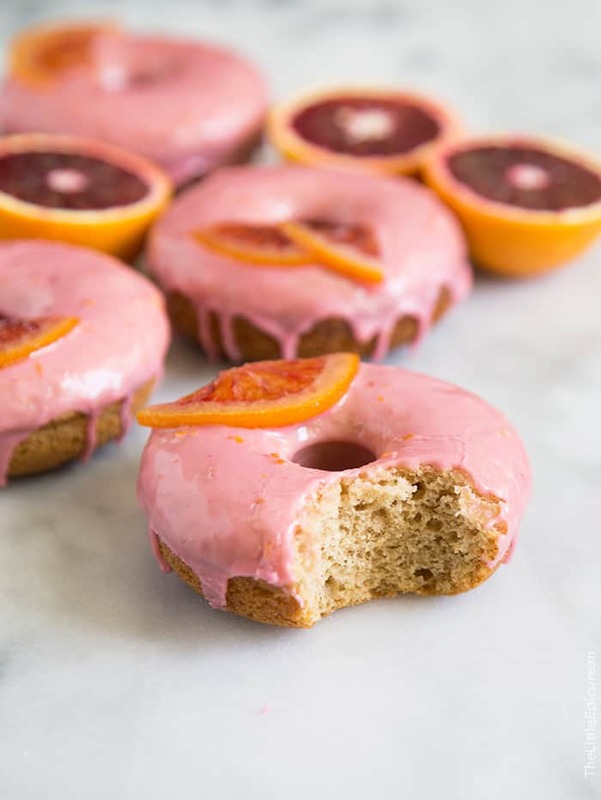 This blood orange olive oil cake I made two years ago was the inspiration behind these blood orange donuts. I needed an excuse to make candied blood oranges. While the recipe only needs a couple slices of candied oranges, I like to make a double batch and use it to top yogurt, oatmeal, and ice cream. Plus, the sugar-honey soaking syrup from the candied oranges is a fabulous sweetener for cocktails and teas. While traditional fried donuts will always have a giant piece of my heart, sometimes I don’t want to deal with heating a pot of oil. 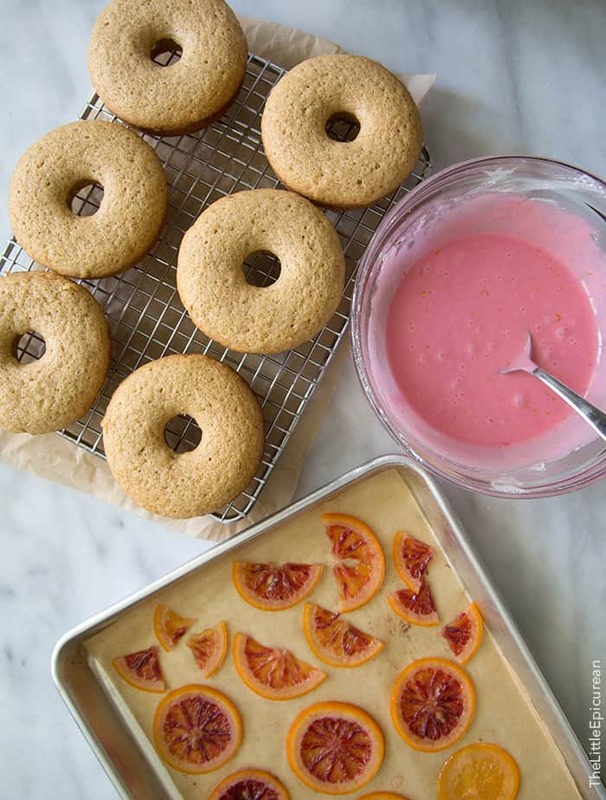 These blood orange donuts may be baked, but they don’t taste as healthy as they are. I just love, love, love the natural pink tones of these donuts. I mean, come on, I’m sure it’s pretty obvious how much I love pink based on the design of my blog. This Valentine’s Day treat your loved ones with blood orange donuts! Donuts are better than a dozen roses. Trust. 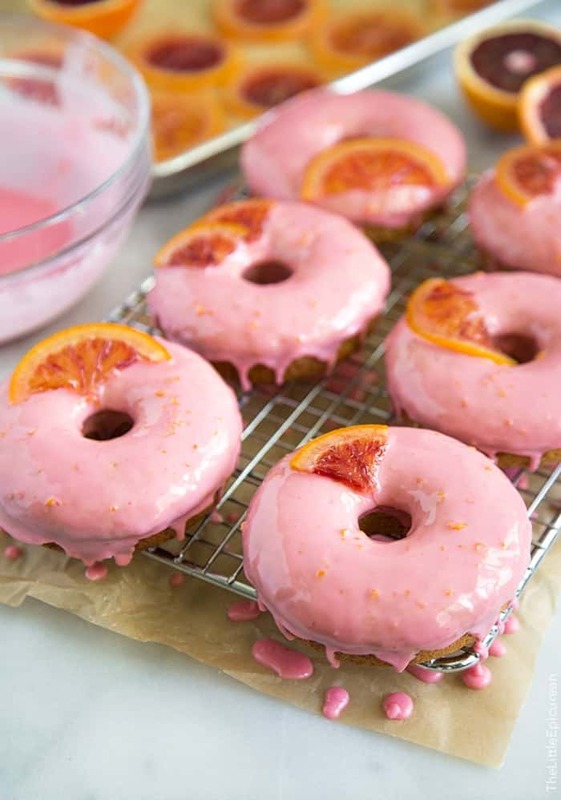 This Valentine's Day forget the chocolate and roses, make your loved ones blood orange donuts. They're baked, all natural in color, and such a delicious treat! Preheat oven to 350 degrees F. Coat donut pan with cooking spray. Set aside. In a large bowl, whisk together flour, baking powder, baking soda, nutmeg and cinnamon. In another bowl, whisk together sugar, brown sugar, eggs, vanilla, vegetable oil, and buttermilk. Add wet mixture to dry flour mixture. Stir to combine until there are no longer than dry streaks of flour. Try not to overmix. Spoon batter into prepared donut pan. Fill molds about 3/4 full of batter. Bake for 12-14 minutes until the donuts have puffed up. Remove from oven and allow to cool in pan for 2 minutes before inverting and unmolding. Allow donuts to cool to room temperature on wire rack before glazing. In a medium heavy bottomed saucepot, combine water, sugar and honey. Bring to a boil over high heat. Stir until sugar dissolves. Once syrup has come to a boil, add orange slices. Reduce heat to low and let simmer for 30 minutes until orange slices are tender and syrup is fragrant. Remove orange slices from syrup and transfer to a parchment lined sheet tray. Arrange slices in a single layer and allow to cool. Strain syrup and save to sweeten tea, cocktails, etc. Whisk together powdered sugar, orange zest, salt and 3 tablespoons of blood orange juice. Adjust thickness by adding additional orange juice, 1 teaspoon at a time. Dip cooled donuts into glaze. Garnish with a piece of candied orange. Place glazed donuts on wire rack to allow glaze to set. *I used this 6-cavity donut pan. Candied blood orange soaking syrup can last a week in the fridge. Thanks Kathleen! Blood orange juice makes the prettiest pink icing everrr! I’m obsessed with blood oranges this time of year. Can’t get enough! Thanks Lindsay! Me too! Now… if only I could grow a blood orange tree in my backyard. That’d be the dream! These are TOO CUTE! Just stunning, and so bright in the midst of winter! I’m jealous because I wish I had made them myself. i agree that winter needs more color. These are so pretty, Maryanne! Just lovely! Right! that’s it, I’m buying a donut pan….. Yes, get one! I use it more than my muffin/cupcake tin! I was just wondering about the texture of the donut. Is it light and fluffy like a donut? Or is it more like bread, or muffin, or cake? It’s like a cake donut. The batter is very similar to a muffin batter. These are the perfect way to brighten up a dreary winter day! Oh my gosh – that last overhead photo glistens with beauty! I can’t get over it – chills. You and I were on a similar wavelength – I used blood oranges as my V-day pink this year too! (Coming up for our giveaway post:). I agree- winter DOES need more pops of color and these donuts bring the sunshine to January! Could you make these ahead of time? How long do you think they’d last? You can make the unglazed donuts a day in advance. I suggest glazing them the day they’re going to be eaten. After two days the baked donuts will get stale and the glaze will start to lose it’s color.